In summer 2011 a nationwide radio multiplex based on the DAB+ technology was launched in Germany. This multiplex offered commercial broadcasters the unique opportunity of nationwide transmission. On FM there are no nationwide services available, despite there being two public services operated by Deutschlandradio. Car drivers in Germany can now enjoy the new experience of listening to the same service whilst driving for hours. All transmitters use only one channel (VHF 5C) for transmission and offer a single frequency coverage securing very high reception reliability. The regional radio conference Geneva in 2006 (RRC06) paved the way for the launch of Digital Radio in Germany a couple of years later by offering new, powerful frequencies in VHF (174 – 230 MHz). Following on from this conference the regulator in Germany (BNETZA) and the federal states (Länder) decided to use the complete VHF band for terrestrial, digital radio based on the DAB+ standard. In the past only Ch 12 was in VHF available for DAB. The maximum radiated power was limited to 1 kW due to military use of Ch13. The RRC06 didn’t foresee such a restrictive limit and thus the network planning was based on the choice of the optimum power in this frequency range and for the respective network infrastructure. Under cost and efficiency aspects Media Broadcast decided to use mainly the available high tower infrastructure. 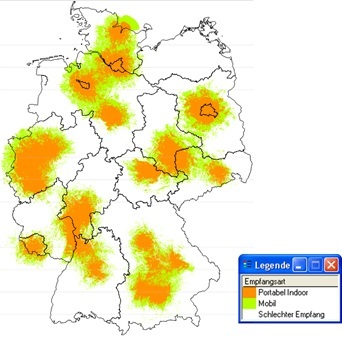 Figure 1 depicts some of these sites; all of them located in centers of the bigger cities of Germany. These sites secured a very high population coverage and a reliable in-house coverage from the start. The coverage of the initial network, on-air since 1st of August, 2011, is depicted on Figure 2 and consists of 27 sites. 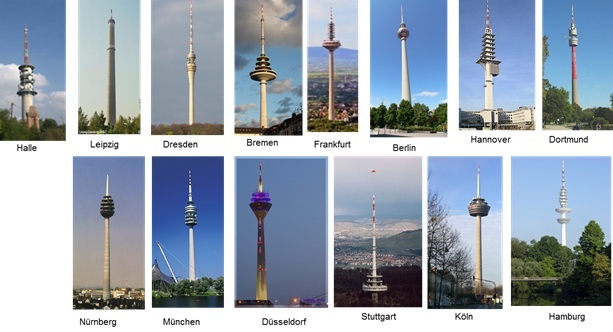 Most of the transmitters transmit with 10 kW ERP and secured from the beginning on a pop-coverage of more than 37 million people (in-house) and an area coverage of 50% of Germany (mobile). Figure 3 gives an impression how many coverage layers are possible based on the use of the VHF band. The (first) national mux is transmitting using only channel 5C and hence presenting a nationwide single frequency network. Further on there are regional muxes on-air. 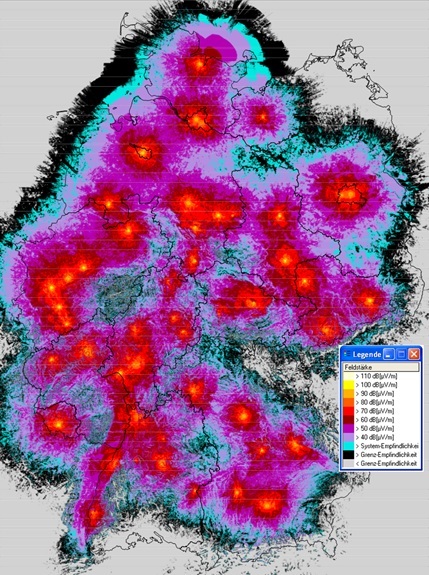 They use frequencies allowing regional single frequency networks. The single frequency approach secures a highly reception reliability and a very homogenous coverage. Figure 3: Frequency allotments available in VHF offer flexible coverage solutions for an impressing variety of services available in every region. These factors indicate that there’s no universally valid approach: every region and every country has to decide carefully taking into account the available infrastructure and coordination constraints. Figure 4 depicts the field strengths achieved by the newly installed network. 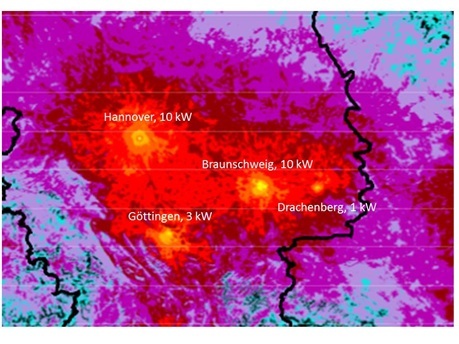 There are some regions where the field strength is still highly homogeneous as shown in Figure 5, covering the region of Hannover and Brunswick which is currently being served by 3 transmitters. Finally figure 6 gives an outlook on a nationwide coverage based on round about 100 sites. For comparison: Deutschlandradio use today 148 resp. 162 FM transmitters for both services. 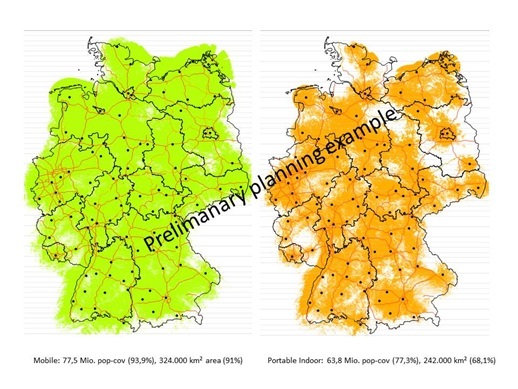 Both FM transmitter networks offer more than 20% less coverage in regard of population and area than predicted in Figure 6 for the nationwide DAB+ network. Have in mind: the DAB+ networks transmits 15 services simultaneously! This entry was posted on May 5, 2013 by WorldDAB in Automotive Industry, Benefits of Digital Radio, Content and Services, Digital Radio Rollout, Europe, Feature Article, Marketing.